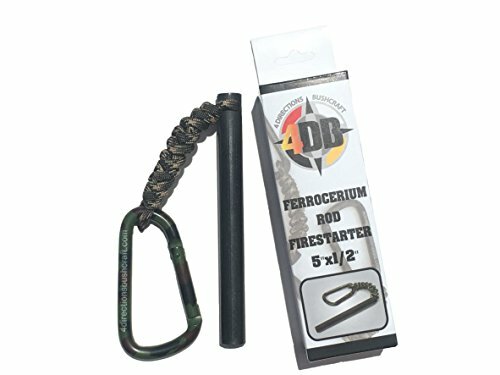 The 4DB 1/2"x5" Huge Bushcraft Ferrocerium Rod Fire Starter with lanyard and camouflage carabiner. • Huge 1/2" x 5" Ferrocerium Rods throw gobs of hot dancing sparks for a lifetime when struck by any 90 degree sharp angle such as the back of a knife, 4DB Osage Orange Striker or any sharp edge. • Made of a perfect mix of soft Cerium and hard iron metal (giving it the name Ferrocerium). Soft Cerium and Magnesium allows for hot 5,430 degree Fahrenheit sparks and hard iron that allows for a lifetime of reliable use and Strikes. •Waterproof fire starting, not effected by altitude, reliability in all weather conditions, non-corrosive to water and air. • Includes a 4 Directions Bushcraft camouflage carabiner (not rated for climbing). •Easy and conveniently clip to any rucksack, back pack, bug out bag, emergency kit or bag, hiking and camping bag, fishing and hunting gear bags and never be without a warm fire.